Authentic German Christmas cookies (Weihnachtsplätzchen), homemade or bought, belong to the festive season. Stollen, Lebkuchen and spritz cookies, macaroons, Zimtsterne, Vanillekipferl, the list of Weihnachtsplätzchen is long. Actually, we Germans are known to be "a bit crazy" about baking for Advent and Christmas. Many families have traditional recipes which have been passed along for generations. 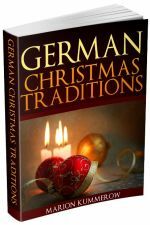 Let me introduce you to historical facts, our all-time favourite German Christmas cookies and traditional recipes from my family. The tradition of Christmas bakery dates back to the Middle Ages. Monks in medieval monasteries baked specialties to commemorate the birth of Jesus. Recipes for Stollen and Lebkuchen were created in these early days of Christmas baking. However, it took centuries until ordinary families could afford to make the delicious treats. Sugar, vanilla, cinnamon and other spices were quite expensive and sheer luxury. From the late 19th century ingredients became more common and affordable for everyone. Meanwhile, some of the delicious sweets have a protected geographical status, like Aachener Printen and Nürnberger Lebkuchen. Accordingly, they have to be produced in these regions to be the real thing. German Weihnachtsplätzchen are made from different types of doughs with various spices like cinnamon, gloves, cardamon, orange and lemon peels, rum and vanilla. Cookies are decorated with sugar and chocolate sprinkles, nuts, almonds, or completely covered with chocolate. 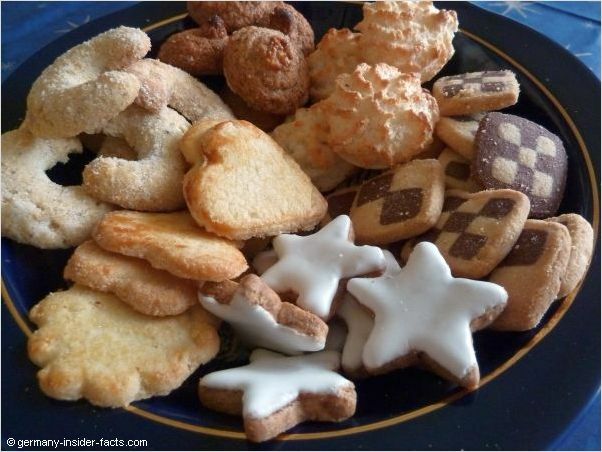 Although it is a bit of work to bake yourself, many families are proud to serve their homemade Christmas cookies. A food processor or hand mixer is a great help, although some doughs become so rich and heavy, they need to be finished kneading with your hands. "When do we bake Christmas cookies?" we kids asked impatiently as soon as Dezember had arrived. Usually, we got the first treat of Weihnachtsplätzchen at Nikolaus Day. We really loved to help mum in the kitchen, kneading the dough, decorating the biscuits, tasting the uncooked dough and the freshly baked goodies until our tummy hurt. When I was young I spent a lot of time making delicious Christmas cookies. I wrapped them in cellophane bags, packed them in decorative boxes, and gave them away as special Christmas gifts. You can bet everyone loved them! These days I don't bake as much as I used to do. 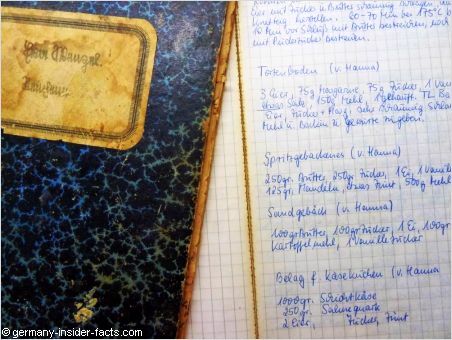 But who knows, now that I am browsing through the stained, faded recipe books of my grandma and my own recipe collection, I might spend the next weekend in the kitchen again :). Anyway, let me introduce you to the most traditional German Christmas cookies and my favourite cookie recipes. Stollen - Weihnachtsstollen, Dresdnerstollen, Christstollen or just Stollen are the common names for this rich, loaf-shaped fruit cake. Coconut macaroons and the variation with hazelnuts are quick and easy to make. Schwarz-Weiß-Gebäck - these shortcrust pastry cookies are created in several pattern by adding cocoa powder to one part of the dough. Lebkuchen or German gingerbread is slightly different to British gingerbread. The harder version of Lebkuchen is used to make gingerbread houses and gingerbread hearts sold at fairs and carnivals. Nuremberg Lebkuchen are well-known around the world. They are soft, and often baked on Oblaten (a thin wafer base). The finest variety is the Elisenlebkuchen that contains almost no flour. Spekulatius is a spiced shortcrust cookie from Belgium and the Netherlands where it is eaten all around the year. 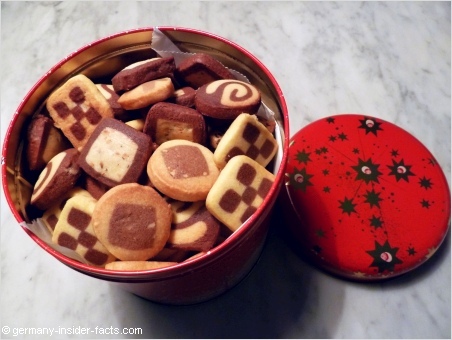 In German regions that border these countries Spekulatius is a favourite Christmas cookie. Spitzbuben - Some sources claim the Spitzbuben to be an original Swiss recipe, however, the biscuits filled with red currant jam are very common in Germany as well. Springerle are little pieces of art. You need a mould plate or roller to make the sweets with the pictures on top. Butter cookies - Although you can buy butter cookies all year round, these are not exactly the same as the Butterplätzchen made for Christmas. Aachener Printen are a type of Lebkuchen sweetened with sugar beet syrup instead of honey. Aachener Printen is a protected regional term, you'll find Printen bakeries only in Aachen and its surroundings. Almond Crescents - Vanillekipferl are another well-loved German Christmas cookie. Vanillekipferl are a must on every cookie plate in December. I highly recommend that you use a Kitchen scale for best results. As we use the metric system in Germany, I am never sure if I convert gram and kilogram correctly into ounces, cups etc. 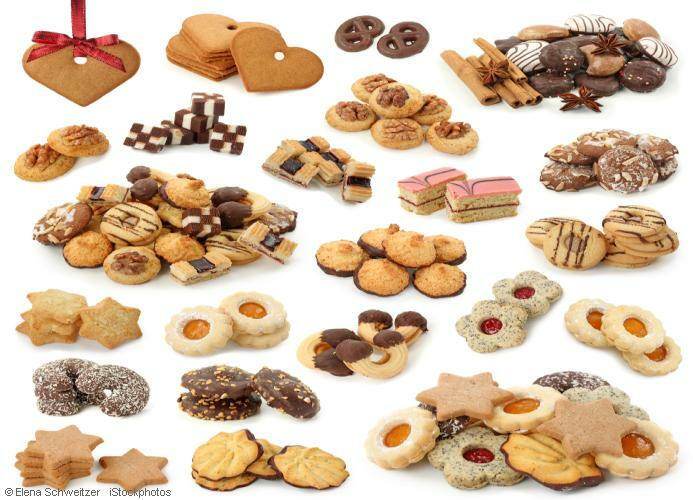 If you don't like baking but love the taste of good German cookies, there is a wide range you can buy in Germany, even online if you live abroad. Bakeries sell really nice Weihnachtsplätzchen, you get homemade cookies at Christmas markets, and even industrial made biscuits are enticing. Of course you'll miss the wonderful smell in the house if you don't bake yourself. In my opinion, some German Christmas sweets require too much work to make them at home, Dominosteine for example. My mother and I have never been successful Lebkuchen (German gingerbread) bakers, they often turned out too hard. Sure, there is the recommendation to put hard gingerbread Lebkuchen into a tin box, add a few slices of apples and wait for a week. However, if you have ever tasted the soft and delicious Nuremberg Lebkuchen, traditionally made by Lebkuchen Schmidt in Nuremberg, you might change your mind about homemade gingerbread. Now did I make your mouth water? Check out my recipes below. Happy baking! Can you smell the scent of cinnamon and cloves? That's the Vorfreude (joyful anticipation) during Advent!